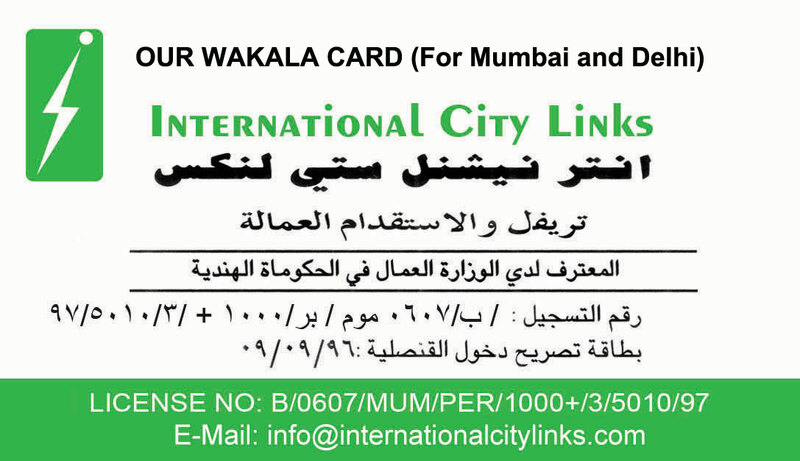 We are an authorized agency with valid Wakala from the Kindom of Saudi Arabia (KSA). So, When our valuable clients contact us for their visit to Saudi Arabia under various category of visas, we suggest and guide them to fulfill all required formalities to obtain desired type of visa . we work directly with the Saudi embassy in delhi and bombay. We assure our best services and cooperation at all times to the client. Our rates of above service are quite affordable. Internatioanl city links since 2010 has been the leading hajj and Umrah travel guides in india with honesty and commitments. We will be there with you for every step of the way, from the moment you make your intention till the completion of your hajj, Umrah With our first-hand experience and in-depth knowledge of the region's history, culture, cuisine and accommodations, you can be sure that all your hajj,Umrah travel needs are handled professionally and efficiently. ICL is a leading destination management company offering world class services to agencies, individuals, corporations and associations in India. ICL focuses on complete leisure and destination management with activities focused on land, accommodation and logistic arrangements for meetings, groups, individual travelers, sports events and congresses. These services can be availed by wholesalers, tour operators, congress organizers,incentive houses, event organizers and meeting planners. Our service specialties include transfers/transportation, meet and greet, restaurants, hotel accommodation, excursions, activities and gala dinners. Naturally, ICL helps clients to overcome language and cultural barriers with a complete assistance. We have a group of highly experienced and committed travel consultants for domestic & international travel. With years of experience we bring you the best possible fares with scheduled airlines (full-service as well as budget carriers) the world over. We believe each customer is unique precisely why, we provide tailor made services to suit your every requirement. We provide numerous web-based comparisons for budget carriers to locate the best viable option available. We value that the process of acquiring a visa for any country is quite time consuming but our team of experienced people will help you with all the necessary formalities and your chances of getting visa will maximize. We give personal attention to all our customers so that you avoid common mistakes due to incomplete application. This automatically avoids delay in visa preparation. Our dedicated and proficient staff provides their key contribution in testing, interviewing and assessment needs. Our professional team has immense knowledge and expertise in the recruitment and consultancy field, which enable us to tackle clients requirements efficiently and promptly. Certificate Attestation for UAE, Saudi Arabia and Kuwait Embassies and from various departments like GAD, State Education Department, NOTARY, HOME MINISTRY, SDM, Delhi HRD and various Embassies. ICL is providing this service of attestation of certificates with many years of the experience. It is managed by professionals to give you efficient, fast and reliable services, which is truly unmatched by others and THIS is a challenge. We assure 100% Genuine attestation on all the certificates at very competitive rates better than the market. We have earned the trust of thousands of our customers including many Big Corporate houses who are regularly dealing with us for their requirements. The company with its presence all over India and The Gulf and Middle East countries is providing efficient and reliable service for certificate attestation to its clients. We attest all kind of certificates, documents, degrees from different State HRD Departments, Ministry of External Affairs, Notary, Mantralaya and different Embassies like UAE, Saudi Arabia, Kuwait, Qatar, Oman and Bahrain, etc.